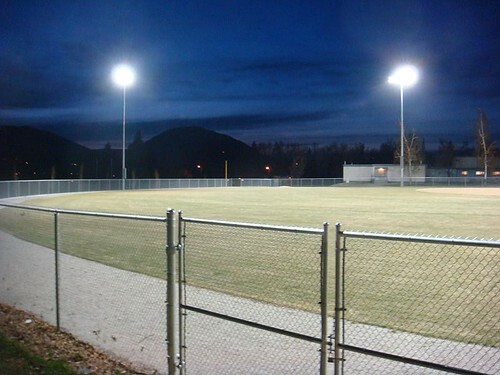 It is Earth Day and I am appalled and disgusted by the complete lack of regard that the both the City of Penticton and a local baseball league has for both the environment and city taxpayers. AGAIN tonight, the baseball diamond lights are on at Nkwala School while no one is playing. And if the past 2 weeks are any indicator, the lights will be on until 10:30PM — a total waste of precious energy and taxpayer dollars. That’s right… this town spends Earth Day adding to the problem of global warming. 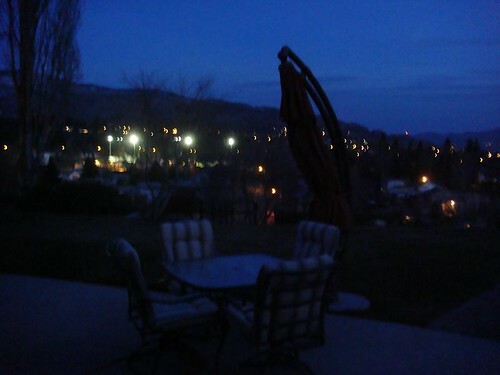 I am particularly disgusted because I spoke at length this morning with a Penticton Parks Board representative about the fact that these HUMUNGOUS lamp standards burn for hours on end almost every night while NO ONE uses the park. 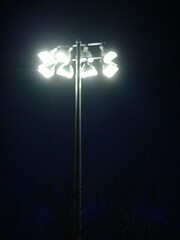 On hearing my complaint, the rep expressed dismay as the lights are on a computerized schedule based on the local baseball league’s stated schedule and the lights must be physically turned on at the field. He assured me that he would speak with someone from the league today about co-ordinating their schedule more accurately. The houses across the street are bombarded by light pollution when they might otherwise be looking across a dark park and enjoying the night sky. While the folks closest to the park suffer most, our once beautiful night view of the city (see below) has also been destroyed by these obnoxious lights for 4 months of the year. The latter picture doesn’t do justice to the headache-causing GLARE that has become the night view from our house in April, May, September and October. It’s hard to fathom that a company in this day and age has never heard of shielding. Anyway, I’m all in favor of kids getting away from the TV and outside to have fun under the lights. But perhaps the irresponsible organizers of the league should be penalized 2 weeks WITHOUT the lights to compensate for their waste. They should then have to explain WHY to the kids affected. Perhaps that would be a effective Earth Day lesson?